In French, this word is a noun, but also a regular –er verb, as in “Je détoxe pendant quelques jours” or “I’m detoxing for a few days.” But like many words transformed from English, it’s also used as an adjective. Glaring down at a bowl of peanuts at a party last weekend, a friend told me, “Ce n’est pas très detox, ça.” Not very detox. My ex-mother-in-law used to détox twice a year. She’d eat grapes, and only grapes, for two whole weeks. At least it wasn’t the Grapefruit 45 diet, although I know plenty of women who wake up, drink freshly-pressed grapefruit juice with a huge glass of water, and then get on with their breakfast and their day. Or they’re taking the detox test just published in Elle magazine to find out which plan d’attaque is the right one. I’m not resistant to maintaining excellent health – au contraire! But at a gathering last weekend, where we were helping our neighbor finish his leftover homemade foie gras, there were definitely two camps. Hoping to prolong the hedonistic pleasure of the holiday season, some of us had brought holiday foods as well. “Some of us” definitely included me: I presented a big platter of gougères, or choux puffs, made with Comté cheese which had been aged for 24 months. But then there was another, resolutely healthier vibe going on at the party. Jerusalem artichoke soup sat on the stove in a large pot, even though some people downright refused it when the host offered them a cup. They said, “Détox, oui. Stomach pain, non!" The good doctor chuckled and said, “No, these are the foods you CAN eat.” On that list were rice, rice milk, rice cakes, and cream of rice – remember cream of wheat? (Cream of rice is the same mushy porridge, made with rice instead of wheat.) Also on the menu were carrots, parsnips, rutabagas, and beets. I think I lost about 8 kilos during that oh-so-cleansing regime. Unfortunately, most of the weight disappeared from one of my only truly decent bodily assets, which will remain unnamed (hint: there are two of them). The upshot? I could actually feel the blood coursing through my detoxed veins, like a high-performance version of myself. Or at least I could until I resumed feasting on eggs, camembert, chocolate, and wine the very day after my diet was finished. Pas très détox…. Made with a bit of white refined sugar, the following recipe isn’t very détox. But does it get pretty close, what with all this citrus fruit and Sichuan, or Szechuan, pepper, which is a great aid to digestion (quite necessary after eating Jerusalem artichokes, for example). The pepper isn’t entirely noticeable in this dessert soup, and yet without it, the recipe just wouldn’t taste the same. The tonka beans are optional, since they’re tough to find in the U.S. I’ve seen them sold – but NOT as a foodstuff – on a website or two. If you’re in Paris, you can pick up tonka beans at Izraël, one of the best spice shops in the capital. One technique in this recipe requires a little practice and skill: segmenting citrus fruit. If you’ve never done it, Saveur magazine has a great video that shows you how to segment (or supreme) any citrus fruit. Since fruit is by nature variable in terms of acidity, I like to taste this before serving to make sure it doesn’t need a little extra sugar to cut that acidity. But the pleasing tartness is also what makes such a nice finish to a rich meal. 1. Zest one of the Valencia oranges into a small saucepan, then thoroughly squeeze the grapefruit and the two Valencia oranges directly into a small saucepan, picking out any large seeds with a fork. You should have about 1½-2 cups of juice and pulp. 3. Combine the sugar and water in another small saucepan. Bring to the boil over medium heat. When all the sugar is dissolved (after about 1 minute of simmering), turn off the heat, and scrape the half vanilla pod’s contents into the saucepan using the back of a small knife. 4. Add the Sichuan peppercorns and grated tonka bean if using. Cover and let steep for about 20 minutes. Strain this mixture into the juice reduction, which should be finished by now. 5. 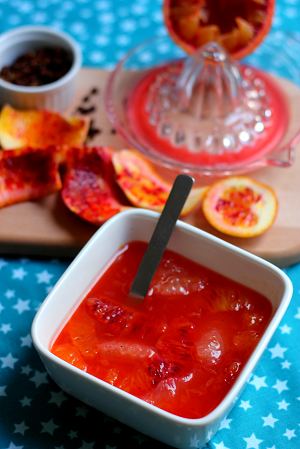 Juice the 3 blood oranges to obtain about ¾ cup of juice. If there’s a little more, that’s fine. Add this juice to the reduction/soup. 6. Segment the remaining fruit over a wide bowl to catch the juice, and squeeze into the bowl the leftover pulp and skins as you go. Pour any remaining juices into the juice soup. Taste the fruit soup – if it’s too acidic, add a teaspoon or two of simple syrup or confectioner’s sugar that will dissolve quickly. 7. Distribute fruit segments evenly into 4 transparent fruit coupes or any small shallow bowls. 8. Pour about ½ cup of the juice into each, and serve, or refrigerate for a few hours to serve chilled. Bon app’!